Preheat an oven to 450 degrees F (230 degrees C). Line a baking sheet with aluminum foil and coat foil with cooking spray. Combine water, vinegar, 1/4 cup salt, bay leaf, thyme, oregano, and rosemary in a large stockpot and bring to a boil. Add chicken wings, return to a boil, and cook for 15 minutes. 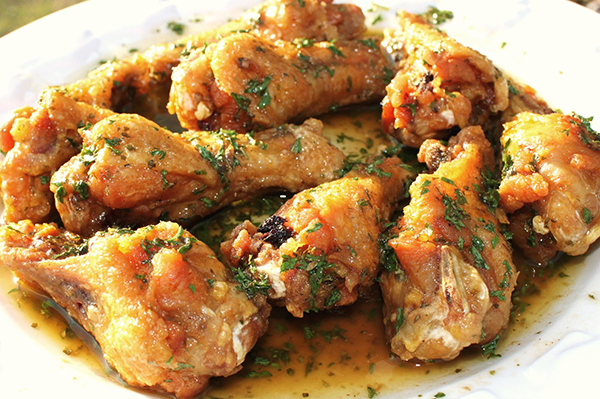 Remove chicken wings with a slotted spoon to a cooling rack and allow to dry for 15 minutes. Mash garlic and a pinch of salt together in a mortar and pestle until smooth. Combine mashed garlic, olive oil, black pepper, and red pepper flakes in a large bowl. Add chicken wings and bread crumbs; toss to coat. Sprinkle with 1/2 cup Parmigiano-Reggiano cheese. Transfer to the prepared baking sheet and sprinkle with remaining 1/2 cup Parmigiano-Reggiano cheese. Bake in the preheated oven until browned, 20 to 25 minutes. No comments for: "Garlic and Parmesan Chicken Wings Recipe"